"Top Gun" and Whitney Houston were making headlines in 1986, which would mark the start of what would become a golden one-generation run for the stock of one of the best-loved companies in the world. 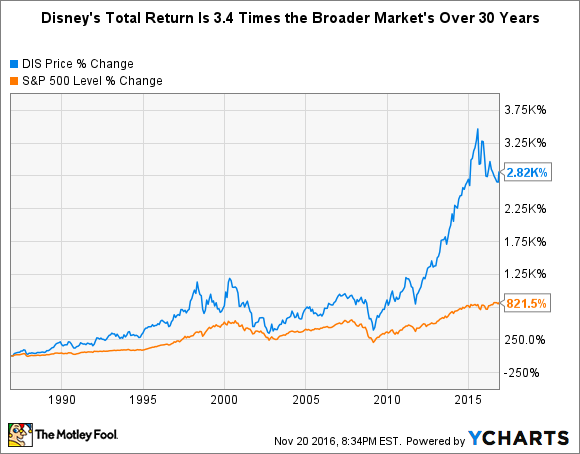 If, 30 years ago, you had invested $1,000 in Walt Disney (NYSE:DIS) stock, your investment would now be worth $29,200, assuming you had reinvested your dividends. This is a magical haul, considering the broader market would have turned your $1,000 into $9,210. To provide more context, Disney's return trumps the returns of many other Dow Jones Average constituent stocks -- Disney joined this illustrious club in 1981 -- that were widely considered more promising "growth stocks" at the time, including McDonald's and IBM, which would have turned your $1,000 into $23,800 and $5,320, respectively. I could have gone for a more click-worthy headline touting a much bigger number than $29,200 by choosing another stock to feature (or a longer time frame, but I don't think many people can relate to more than 30 years). But it's hardly news that high-flying tech stocks such as Apple, Netflix, and Amazon.com would have turned your $1,000 into staggering sums in varying time periods. (Neither Netflix nor Amazon has been publicly traded for 30 years). Moreover, tech stocks in general, especially tech IPOs and stocks with stratospheric valuations, aren't all investors' cup of tea -- at least not for 100% of their stock portfolios. I chose to feature Disney to make the point that you can invest in solid, well-established companies -- and Disney was such even 30 years ago, as it was founded in 1923 and its stock began trading in 1946 -- and still post market-smashing returns over the long term. Now, let's dig into what happened in Disney's business to drive its revenue and earnings growth over the last 30 years, and turn that $1,000 stock investment into a substantial sum. Going 30 years back puts us in 1986 – the era of big hair, shopping malls, and the popularization of preppy clothing, with Boston's "Amanda" topping the music charts, which were being dominated by Whitney Houston. In 1986, Disney was already a well-established entertainment giant -- it made movies and TV shows, operated massive theme parks, and licensed its immense collection of intellectual property for use on a plethora of consumer products. So, the foundation was solid. Current CEO Bob Iger took the acquisition ball from Eisner and ran with it. Under Iger's tenure, which began in 2005, The House of Mouse has strengthened its foundation -- movie-making -- by acquiring studios Pixar, Marvel, and Star Wars creator Lucasfilm. This is important not only for the obvious reason that it's allowed the company's studio-entertainment business to generate fantastic profit growth in recent years -- a whopping 28% in fiscal 2016 -- but also because the company leverages its movie successes throughout its other businesses, most notably at its parks and in its consumer-products business. Data source: Box Office Mojo ; data last updated on Nov. 20 at 9:22 a.m. PT. And the next 30 years? Nobody can know if someone will be typing (or, most likely, "speaking") an article 30 years from now saying that if an investor had plunked down $1,000 in 2016 that he or she would now be sitting on some headline-worthy big sum of money. However, there's every reason to believe that will prove to be the case. Disney reigns as top dog in a broad industry -- entertainment -- that will never go out of style. The company owns a treasure trove of intellectual property; its parks -- including Shanghai Disney Resort, which opened in June -- are performing well; and it's been taking aggressive steps to position itself to thrive in a changing consumer TV-viewing market, including getting ESPN and some of its other channels included in "skinny" over-the-top streaming services and buying a 33% stake in video streaming leader BAMTech.